Powers/Abilities: Elizabeth had no superhuman powers. She was an attractive young woman. Though willing to plan a seduction and betrayal, when she fell in love, she was unable to go through with it. Weight: Unrevealed; perhaps 130 lbs. (X-Men: Hellfire Club#2 (fb) - BTS) <1778> - At the age of 13, Elizabeth Shaw left her native England and came to America, in search of a brighter future, dreaming of a life better than the one she left behind. (X-Men: Hellfire Club#2 (fb) - BTS) - Elizabeth ended up homeless, living in the gutters and alleys of Philadelphia. 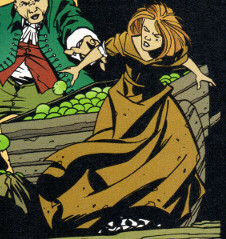 (X-Men: Hellfire Club#2) <1780> - Caught in the act of stealing an apple from a street vendor, Elizabeth dropped the apple and escaped the older, heavier vendor on foot; she was unaware she had caught the attention of Lady (Jean) Grey of the Hellfire Club, who had been passing through town in her carriage. As Elizabeth gazed longingly at some dresses through a window, she was approached by Lady Grey; after Grey spoke to her on the values of dreams, Elizabeth asked if she could be of some service, but Lady Grey, showing her the apple she had obtained, told the young girl, "Actually dear, I believe I can be of service to you." (X-Men: Hellfire Club#2 - BTS) - Elizabeth boarded Lady Grey's horse-drawn carriage, guided by her servant Jarvis. (X-Men: Hellfire Club#2) - The carriage arrived at the Hellfire Club estate. (X-Men: Hellfire Club#2 (fb) - BTS) - Lady Grey arranged for Elizabeth to seduce Major-General Wallace Worthington (whose financial status was presently embattled) with the goal of learning military secrets he would have (as Worthington was replacing the traitorous Benedict Arnold as Philadelphia's commandant). (X-Men: Hellfire Club#2) <six months later> Elizabeth met with Worthington, along with is ally Captain Steven Rogers (aka the "Captain America" of the Revolutionary War). Claiming to be fascinated with Worthington's stories, she told him she had never met of anyone possessed of such a commanding presence. Returning the compliment by noting her to be the most beautiful woman he had ever beheld, Worthington asked her to dance, and she accepted. (X-Men: Hellfire Club#2 (fb) - BTS) - Despite her best efforts to the contrary, the fires of greed and ambition died with Elizabeth as she fell truly in love with Wallace. (X-Men: Hellfire Club#2) <1781> - On a bitter night, Lady Grey chastised Elizabeth for falling in love with Wallace and failing to gain his military secrets. Grey warned that, without these, the American revolution would succeed, and Elizabeth, would have all of her "puppet strings" cut; "...such is the price of freedom." (X-Men: Hellfire Club#2) - As Elizabeth arrived, Captain America (Rogers) burst from the burning house carrying Worthington, who had been badly beaten by his attackers and left to die in flames. Elizabeth rushed to Wallace's side, apologizing, but after telling her he had refused to share the secrets they wanted, he died in her arms. Additionally, if Elizabeth is a descendent of Hiram Shaw, then perhaps Hiram or Obadiah moved back to England after the events of X-Men: Hellfire Club#1. Or Hiram had children from a previous marriage (or out of wedlock, though the offspring carried his last name) that remained in England after Hiram traveled to Salem, Massachusetts. I think the series was supposed to show that Hiram's descendents were tainted by his curse, and so I would think it almost certain that Elizabeth was Hiram's descendent. I like the idea that Abigail Harkness was pregnant, and that Obadiah fled with the child after its birth due to fear of Abigail's being a witch. Alternatively, perhaps Abigail convinced Obadiah to stay with her, and they both relocated to England. Or Hiram went to England and had a new family. The world may never know. Elizabeth was no more than 16, and possibly only 15, when she initated the romance with Worthington. People didn't live as long and tended to mature fairly early, so that young of a marriage was not uncommon at all back then. however, multiple resources name her as Elizabeth Shaw-Worthington, and it wasn't unheard of to hyphenate back then. Or, perhaps the handbooks used it as a form of concise clarification.